Van Lingle Mungo was a very colorful ballplayer. I've read outrageous stories about his carousing in Cuba during Spring Training to his drinking that effected his marriage and career. He was able to play 14 Major League seasons, most of which with the Brooklyn Dodgers, and is known in pop culture for a song that was named after him. After all, a tune featuring lyrics with only ballplayer names (and some unusual Baseball names at that) can only fittingly be named after the ballplayer with the strangest of names. BTW, I was reminded of this song from a post from Number 5 Type Collection. Anyway, enjoy the song below. It was written and performed by Dave Frishberg. 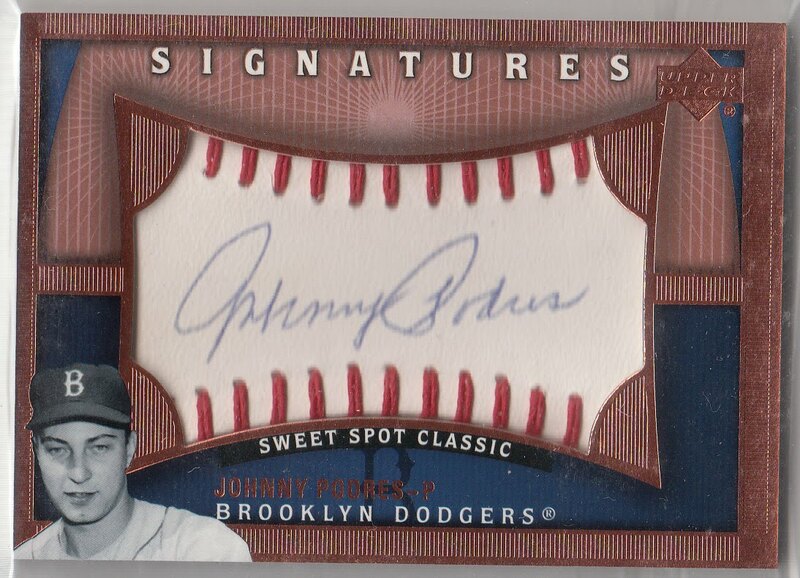 Another autograph every Dodger collector should have is that of Johnny Podres. He pitched a majority of his career with the Blue Crew and was the pitcher who was able to deliver the Dodgers first World Series Championship in 1955. In my mind, his accomplishment that year is worthy of a Hall of Fame induction. Unfortunately, I'm probably the only person in the country who thinks that. 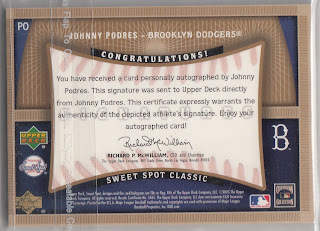 Anyway, here are a couple of 2005 Upper Deck Sweet Spot Signatures from my collection. 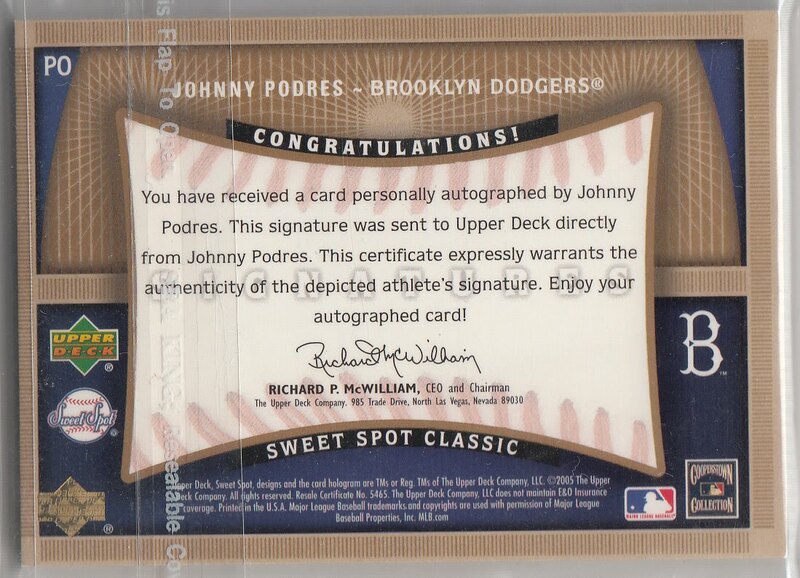 Above is the normal signature insert card. Below is a limited variation that includes red and blue stitching. It is numbered to 40. OK. Most of you probably don't care, but the NHL playoffs are here. The Kings first game is tonight against the San Jose Sharks. It'll be a tough one; especially considering the recent injury of their top scorer, who also happens to be their best defensive forward- Anze Kopitar. I still have faith, though. Go Kings Go! Will video trading cards be the next big thing in the card hobby? Upper Deck has some video cards in a college football set called Evolution and Panini is coming out with their own version for a basketball set. See a Upper Deck break with one video card here. I wonder if Topps will jump on the bandwagon and make some cards for Baseball. GCRL remembers former Dodger Myron White. Bob Lemke points out a uncorrected error on a Don Drysdale 1995 Topps Brooklyn Dodgers Archives card. It's a pretty funny one. With the NHL playoffs now in full swing, here is some interesting background on the playoff beard, from the Montreal Gazette. Here is a very nice fan made Kind Playoff video, first seen on Surly & Scribe.